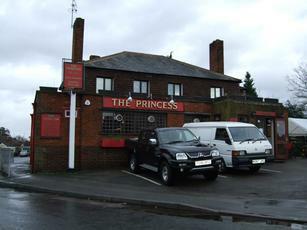 Since the decline of the nearby Birch & Pines I have been using the Princess as my local and I certainly don't recognise anything of the pub in stubbsy's somewhat bitter comments. I have found the Princess to be particularly welcoming, both the customers and the staff. Recently it hosted a suprise 40th birthday party for a friend of mine and nothing seemed too much trouble: a fantastic buffet was put on and the landlady Sarah even gave my friend a present herself. The pub is generally clean and tidy and certainly not smelling of sweat or stale beer. There is an l shaped bar and, although everything is interconnected, there is a distinct "public bar" area with pool table, juke box and quiz machine. The rest of the bar is furnished with three tvs for sport, some traditional pub tables and chairs and, most importantly in the winter, a roaring log fire. There is a covered smoking area to the rear, a family/function/darts room a seated patio area and a garden for the kids to escape in. As well as the usual keg selection, there is only one ale served now, usually Marston's Pedegree, although recently London Pride was on for a week. Food is limited to good old fashioned pub staples: pies, sausage rolls, hot dogs and filled rolls. There are entertainments laid on for all the usual dates: Christmas, New Year, Valentines, Halloween, St Patrick's Day, Bank Holiday etc. This is a typical workmans rest place after work, it smells of sweat and stale beer, its rowdy and very clicky, you are only welcome here if you are a local it seems, otherwise stay away, my recommendations would to be,to Keep walking. Visited Saturday evening to watch Spurs v Man Utd. Friendly welcome, decent beer - growing collection of pump clips behind the bar testimony to variety of guest beers they are having on here. I occasionaly pop in this pub on a Friday night. Admittedly you can get a few stares when you first walk in, but it doesn't take long to get friendly comments etc. It's pretty scruffy, but, after the early session wobblers and the mothers and toddlers depart, a good pint of Jennings Cumberland and a half decent juke box can make for a convivial Friday evening.